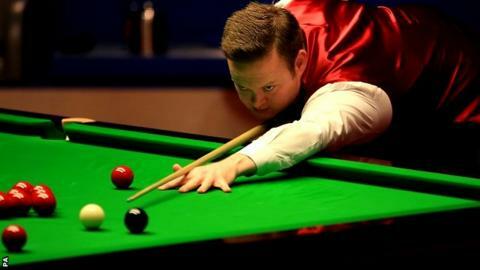 Former champion Shaun Murphy needs one more frame to reach the World Championship final despite a fightback by Barry Hawkins. Murphy resumed the best-of-33 semi-final 13-3 ahead but was left frustrated as Hawkins won five of the eight frames. Hawkins won four frames in a row but Murphy, the 2005 winner, still leads 16-8 before Saturday's final session. Stuart Bingham moved 9-7 ahead against Judd Trump in the other semi-final. Trump, a runner-up in 2011, displayed attacking intent from the start on Friday but found himself 6-3 behind after a costly mistake allowed Bingham to extend his lead. But Bingham could only watch the next frame as 25-year-old Trump responded brilliantly with a break of 113. Nerves threatened to get the better of Bingham, a mistake allowing Trump to clean up and narrow the gap to one frame. However, Bingham's response was impressive as he claimed the next two frames to lead 8-5. Trump showed character to take the 14th and, crucially, 16th frames after Bingham had gone 9-6 up with a break of 85. The match resumes at 10:00 BST on Saturday. Murphy only needed to win four of the eight frames to secure his first Crucible final appearance since 2009 with a session to spare. But, having been outplayed in the opening two sessions, Hawkins finally showed the qualities which saw him progress to the 2013 final. It all looked a formality as Murphy quickly extended his lead to 14-3. But few inside the Crucible predicted what would happen next, Hawkins claiming the next four frames with breaks of 103 and 104. Murphy rediscovered his form to take the next two frames, including the 23rd of the match after a well-crafted break of 106, although Hawkins took the last frame to win the session 5-3. The match will resume at 14:30 BST on Saturday.